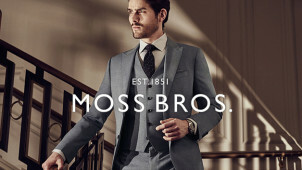 Moss Bros. is a British men’s fashion label that has been trading since 1851. Its first store originated in London’s West End, set up by a tailor called Moses Moss. Although the main income came from making bespoke suits initially, there was a shift to ready-to-wear garments and also clothing hire at the start of the 1900s. Moss Bros. reputation swiftly grew, as did its number of retail outlets. In 2011, the label went online, which enabled Moss to become a truly international brand, selling menswear all over the world. Moss Bros. is one of Ireland’s leading formal menswear bands - giving men a massive choice of shirts, suits, waistcoats, knitwear, accessories and shoes fit for any special occasion or a dapper work wardrobe. The online offering at Moss is tip-top and brimming with tanalising sharply-tailored garments for boys, men and those who find standard sizes restrictive. If you don’t wear suits very often and don’t wish to shell out unnecessarily, go to the Hire section and borrow the perfect ensemble for a weekend. How do I use my Moss voucher code? Choose a voucher code to copy from the vouchercloud site. Click ‘shop now’ and wait to be redirected to the Moss website. Shop for your items, and go to ‘checkout’ when ready. Pop your voucher code in the box provided, click ‘apply’. Click ‘checkout’ button to go through to the payment page. Sign up to the newsletter and get loads of great offers delivered direct to your inbox. Does Moss offer any garment care advice? Yes, you will find some helpful guidelines here. Can I return an item to a Moss store? Yes, but it depends on your original method of payment. You cannot return or exchange orders in store that have been purchased using PayPal, Login and Pay with Amazon, or purchased from the Amazon store. Does Moss provide a size guide? Yes, you will find it here. Most items are returnable, though you most make a claim within the allotted returns period. Read the full policy here. Use the Store Finder tool to locate your closest outlet and its opening times. Moss Bros. has been suiting up men in the finest tailored garments since 1851. Timelessly classy, with a modern cross-over, menswear never looked so good. Got a Moss discount code? You should definitely use it to snap up a new suit and some accessories perfect for parties, weddings and work. When you’re making such great savings, you can stock up your wardrobe without feeling guilty! If you’re new to being suited and booted, or simply need some fresh ideas for a tired wardrobe, then you should head to the Moss blog called ‘The Inside Pocket’. For newbies and fashionistas alike, the Moss blog is the place to get inspiration. You can read articles about how to achieve a certain look, how to get multi-looks out of one garment, seasonal trend focuses as well as more general lifestyle advice. If you’ve got a big day coming up - perhaps you’re graduating, tying the knot or leading a big presentation at work, looking the part will give you extra confidence. When you want to go the extra mile to look good, nothing can be classier than a waistcoat. Use a Moss voucher to purchase a plain, checked or striped waistcoat to match your suit. Slim fit, regular or Big & Tall options mean you’ll find your perfect fit!